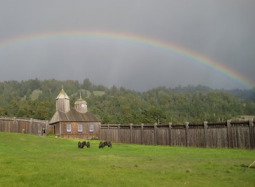 Fort Ross: Russians to help? Speaking on the sidelines of last week’s UN General Assembly, Russian Foreign Minister Sergei Lavrov called for Fort Ross to be preserved as a reminder that the United States and Russia enjoyed warm relations long before the start of the Cold War. Fort Ross was founded in 1812 and functioned for 30 years as Russia’s southernmost settlement on American soil, supplying food and otter-fur pelts to Russian colonists in Alaska. The grounds, which have been designated a U.S. national historic landmark, feature traditional wooden-beam houses and a Russian Orthodox Church modeled on those built by the fort’s settlers. Only one original building — a wooden home belonging to the fort’s last manager, Aleksandr Rotchev — remains on the premises. Perhaps it would be a good idea if American Orthodox volunteered to raise matching funds in conjunction with the Russian embassy.